Every business wants to know how to build their social media following by leaps and bounds, but the truth is there isn’t one formula that works for everyone. It takes a few different approaches to slowly build momentum and attention on social media from an engaged and relevant following. Many strategies for building an audience do work, but they must be used in tandem with one another in order to produce long-lasting results for your business. It is important to note that your following on social media isn’t everything. While the number of people following you is important, the quality of those followers is really crucial. How active your following is when you’re posting content and having conversations with them denotes the quality of your following. If the quality of your audience is high, meaning they are relevant and interested in your services, then having a large amount of followers is wonderful. If your audience is poor quality with no true interest in your brand then the number of followers your business has is irrelevant. In this extremely comprehensive infographic, My Clever Agency dives into how to craft the perfect post on each of the major social media networks including Facebook, Twitter, Pinterest, Google+, Instagram, and Vine. Even though there is no such thing as a perfect post, these tips on how to optimize each type of post across social media are a really helpful way to give the most visibility possible to the content you plan to share. However, the information in the last section of the infographic is right by some accounts and incorrect by others. The section on optimal timing for social posts is a highly debatable subject since the “best times” to post your content on social media differ for every industry, social channel, and individual business. Therefore, take this information on social timing into consideration as a reference point but don’t take it as the final say on when you should be posting your content across social media. The best way to discover when to post your content on social media is through experimenting with different times of day and days of the week. Once you’ve found your sweet spot of when to post to gain the most engagement, compare these times with “best practices” and see how they match up. Keeping up with the proper image sizing dimensions for all the social media networks out there today is exhausting since they are constantly changing. A business needs to keep in mind both the proper dimensions of content that’s posted to each channel, as well as the proper dimensions of the channel’s background, header, cover photo, or other creative that builds an experience for your account on that network. The sizing of these assets is important for giving the right impression of your business, helping to define your voice and establish your brand online. Here’s SumAll’s social media image sizing cheat sheet for Facebook, Instagram, Twitter, YouTube, LinkedIn, and Google+. Using visuals on your social media channels is the most effective way to create an engaging experience for your followers, as well as encourage them to share your content with their network. 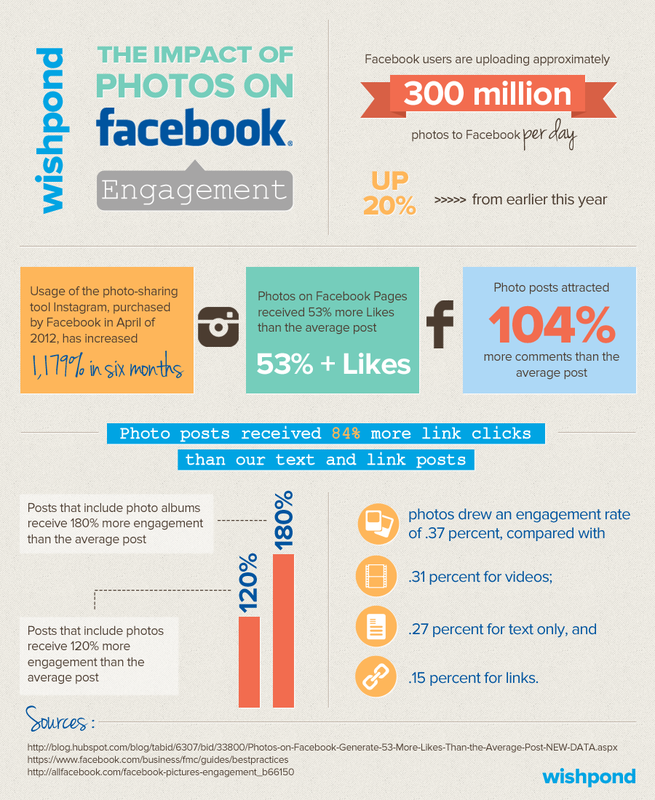 Wishpond put together this infographic of statistics and figures that help prove the value of using photos among the content your business is sharing on Facebook and Instagram. The infographic states that 300 million photos are uploaded to Facebook each day, which is a 20% increase since last year. It’s time to rethink your strategy to ensure you’re better incorporating social media across all your active platforms. It’s never too late to get it right, but if you don’t start now it will be even harder to do so in the future. Brian Solis and JESS3 have come out with the 4th version of the Conversation Prism infographic this summer to help continue to illustrate the continuous evolution of the social landscape. This is an extremely valuable resource for marketers, brands, and business owners trying to interpret the different players across the social web and what categories they fall under such as social bookmarking, pictures, live casting, influence, quantified self, social networks, blogs, crowd wisdom, etc. Every year this prism becomes more complex than the year previous, but the only consistent feature is that people will always be at the center of the prism. Every year the popular blog Social Media Examiner releases an extensive report on the state of the social media industry, highlighting the developments across the marketing channel for marketers and business owners alike. The 2013 social media report answers some of the top questions asked by marketers, illustrates what type of time commitment is required to effectively use social media as a marketing channel, the overall benefits of social media, it explores the most-used social media platforms, and offers other analysis of existing trends in the market. Smashzine released an infographic highlighting some of the most interesting statistics and figures about social media marketing today, covering everything from the impact of consumer tweets to the daily use of Google+. According to the infographic, every day 100,000 tweets are sent, 684,478 pieces of content are shared on Facebook, 2 million queries are searched on Google, 48 hours of video are uploaded on YouTube and 3,600 photos are shared on Instagram. The infographic also features the number of registered users on each network, daily active users, time spent monthly on each channel, the male vs. female ratio of users, insights on social gaming, mobile, and the use of coupons on social media. Like mentioned above, it’s hard to say what the best time is to post on social media for your business. One optimal posting time doesn’t work for everyone in every industry; it varies greatly business to business. However, there are some trends that Social Caffeine has identified across Facebook, Twitter, LinkedIn, Google+, and Pinterest that businesses can use as a basis to start with and then continue to experiment on their own accounts to figure out what works for them. For instance, this infographic says that posting at 1pm to 4pm is the best time to post, while 8pm to 8am is the worst time to post. For more on what times can work for each channel, see below. The Global Web Index released a report on the growth of various social channels in 2012 to reveal some interesting statistics about which channels were growing the quickest. According to the report, Twitter is now the fastest growing social platform in the world. Twitter users have grown by 40% in 2012, which is a 714% increase in growth since 2009. This is important for marketers to understand and analyze because it helps illustrate where your business should spend time, money, and effort interacting with your customer base. With the hundreds of social media channels out there it hard to figure it out where to focus your efforts for the biggest return on investment. A good rule of thumb is to use social media platforms with a large audience that already includes your customer base. This report can help better inform your social strategy for the future. According to JESS3’s latest infographic, there were 5.98 billion mobile devices in use globally as of February 2013. There are many online platforms and social networks that make up this mobile landscape, starting with platforms like Instagram, Snapchat, and Foursquare that are used by their audience almost exclusively on mobile devices to platforms like Mixi, Yelp and Skype that are all used by under 12% of their audience on mobile. This infographic is beneficial for marketers and business owners alike to see the different players in the industry that are making an impact based on their user base and how mobile focused their users and the company have become. It’s interesting to see some platforms like Yelp with 55 million users is only utilized by 10% of their audience on mobile, a statistic that I would assume would be higher than it was in February of this year. Lastly, it is important to note from an international perspective the scale at which Asian social networks like Mixi, Qzone, and Sina Weibo have begun to grow and become major players online based on their audience size and mobile penetration in China and Japan. It is becoming more and more apparent that a strategic approach to customer service through social media is important for the long-term success of a business. The infographic below from Bluewolf highlights key statistics and figures to help illustrate the value of effective customer service through social media. According to the infographic, 87% of customers demand better service which makes sense because effective customer service improves a consumers overall experience with your product or service. Today, social media allows businesses to listen and communicate with their customers on a larger scale. These tools can make it easier to listen to your customer’s feedback, but with no strategy in place, customer feedback on social media can backfire if not addressed. This infographic can help illustrate the value of social customer service to your boss, peers or team. According to the guide, a 1% improvement in first call response can equal $276,000 in annual operational savings for the average call center. Social media can help be the catalyst of these savings for your business, further driving home the value of this customer service channel for your company. Last but certainly not least, social based customer service is a way to quickly outpace your competitors. 58% of people who have tweeted about a bad experience have never received a response from the offending company. This brings to light how much other companies aren’t listening and therefore, it’s a huge opportunity for your business to stand out amongst the crowd and deliver an amazing experience to your customers. What resources do you use to help better inform your social media strategy? Please share your favorite resources in the comments below!